Lions defender Colin Jones gets a hand in the face of Notre Dame guard Stedman Ford, 2, who scored a game-high 31 points. (CANDICE JONES photo). CHATTANOOGA - There was nothing easy for Cannon County in its dramatic 73-59 overtime win against host Notre Dame in the first round of the Region 4-AA Tournament at Phifer Gym Saturday night. Playing on the road against the District 7-AA regular-season and tournament champions, Cannon County took advantage of a free pass to reach the Region 4-AA semifinals for the first time since the 1999-2000 season. The Lions (21-12) will face rival DeKalb County, a first-round winner over Grundy County, at White County High School in Sparta Tuesday at 6 p.m., with a spot in the Region 4-AA finals and subsequent TSSAA Class AA State Sectional berth on the line. "We have eight seniors and we have never been past the first round of the region so this is just great. We have to keep it going," said Cody Ruehlen who turned in a double double with 18 points and 10 rebounds, including 3-of-5 shooting from 3-point range. Cannon County remains alive because it took advantage of charity in the biggest game of the season. The Lions were 26-of-30 from the free-throw line, keyed by Justin Davenport's record-setting display from the charity stripe. Davenport was 18-of-18 from the line to set the Lions' single-game record for most consecutive free throws, besting the mark of 17 straight by Johnny Travis against Lebanon in 1964. Davenport converted all of his pressure-packed attempts in the final 2:44 of regulation and overtime. In fact, 28 of Cannon County's 30 free-throw attempts came during this span. Davenport led the Lions with 25 points, followed by Ruehlen's 18 and Jared Nave finished with 16. Colin Jones and T.J. Mitchell added six in a winning effort. "You have to practice to were it is just muscle memory when you get up there (at the line) and you get in a rhythm," Davenport explained. "Most of it is confidence. If you are in the gym a lot working on free throws then when you get up there you know it's going in. That's half the battle." Davenport was not alone in his free-throw shooting prowess. Ruehlen was also strong at the line when it mattered most. Ruehlen was 7-of-8, including converting two critical charity tosses with the game tied, 54-54, with seven seconds remaining. His two makes proved pivotal after Shaqualm McCoy rebounded Michael McCutcheon's 3-point miss and put it back in for his only points of the game with no time left to force overtime. "At the end of regulation I was not happy because the last words out of my mouth leaving the huddle was you have to pull the board after the miss," Cannon County Head Coach Matt Rigsby said. "We give up the offensive rebound and have to go to overtime. We have to learn from that but what I'm really proud of is the poise and character our kids showed when things got tight. We did most all of the little things right and that was the difference. "This was the most intense/fun basketball atmosphere I have played in as a player or coach. In all honesty, had we come away with the loss I would have been heart-broken but I would wake up the next day as proud of my kids and Notre Dame's kids. It was just a great game." Stedman Ford's individual performance made the game more dynamic than it should have been at the end. Davenport's 7-footer provided the Lions their largest lead, 43-30, with 4:22 remaining in regulation and Cannon County seemed well on its way. That's when Ford took over. He scored 22 of his 31 in the fourth quarter, including 16 straight points at one point. He knocked down five 3-pointers during that stretch, including a deep trey to tie the game, 54-54, with 13 seconds remaining. "There really was noting more we could do against him," said Ruehlen, the District 8-AA Player of the Year. "We were guarding him. We were there and had a hand in his face. He was just on fire. All we could was put a hand in his face and he still made them. I have never played against anyone who has done that against us." After Ford's game-tying 3-pointer, the Fighting Irish attempted to trap Ruehlen and go for the steal but fouled him instead. Ruehlen converted both free throws to extend the lead to 56-54 before Notre Dame forced overtime at the buzzer. Cannon County won possession in overtime and Nave, like he did to start the game when he scored 12 of his 16 in the first half, opened the scoring with a 3-pointer from the top of the key to give the Lions a 59-56 lead with 3:34 remaining. Brian Cripps jumped in front of the inbounds pass, collected a steal and converted a layup to push the lead to 61-56 with 3:17 remaining. "It should not have come down to overtime but when it did our attitude was, 'OK, that's over. Let's go get the win,'" Davenport said. "The biggest shot of the game was when Brian Cripps got that steal and scored. That put us up two possessions and they never overcame that." Cannon County controlled the game throughout after jumping out to a 14-7 halftime lead. Nave knocked down two 3-pointers during the opening frame to establish the Lions and hit his first three shots. The Lions led 27-22 at the half and controlled the game in the second half and started the fourth quarter with a 7-0 run to build a 43-30 lead before the fireworks really started. The Lions held Notre Dame to no field goals and forced four turnovers in the first four minutes of the fourth quarter before Ford started driving the Irish's comeback. TO ALL CCHS PLAYERS:::WAY TO GO:::YOU GUYS HAVE SHOWN WHAT DETERMATION MEANS AND ABOVE ALL THE PRIDE U PUT IN YOURSELVES AND THIS COUNTY::GOD BLESS EACH OF YOU YOUNG MEN::THANK YOU !!! What a game, to survive the furious drive of one player # 2, that kid couldn't miss at the end of regulation...I don't think i have ever witness anything like this game.... for the lions to play as a team and withstand such a comeback from an opponent and not give up...this shows how much heart this team has...NEVER GIVE UP...and the lions never did....this was a great win and should give them momentum to push forward....all around team win from players to coaches and the crowed made the difference.....it had to feel like a home game to the boys..tons of support...good luck Tuesday night!!!!! WAY TO GO LIONS!!! GREAT TEAM WORK!!!!!!!!!!!!! "Much as it had done all season, just when things looked worst, the Notre Dame High School boys’ basketball team found a way to make things interesting. The Fighting Irish trailed by 13 points midway through the fourth quarter before rallying to send the game into overtime thanks to a Herculean effort by Stedman Ford. But Cannon County’s free-throw marksmanship was too much to overcome and the Lions claimed a 73-59 Region 4-AA quarterfinal victory. With two other Irish starters having fouled out, Ford scored 22 of his game-high 31 points in the fourth quarter, including 16 straight at one point. But it was Shaqualm McCoy’s putback at the buzzer that forced overtime. The Lions opened the extra period with a 3-pointer by Jared Nave and a steal and layup from Brian Cripps to put Notre Dame back on its heels. “It took so much for us to just get back into the game and tie it at the end, I think emotionally we were just drained,” Irish coach Brad Harris said. “Once we got down by five in the first few seconds of overtime, it was just too much for our guys to come back again. We were just out of gas. Cannon County converted 26 of 30 free throws, including 13 of 14 in the fourth quarter and its first 12 of overtime. Notre Dame led only twice, both times in the first three minutes of the game. 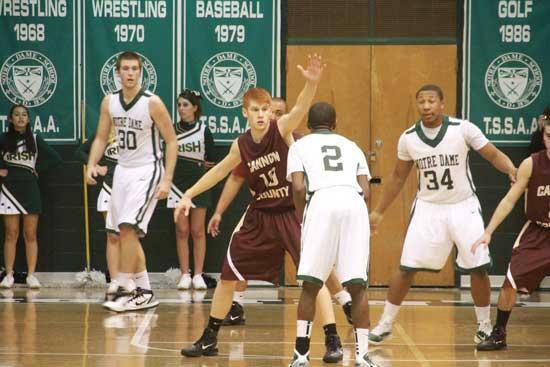 Ford made three of his five 3-pointers in the final 57 seconds of regulation to bring the Irish back. Michael McCutcheon narrowly missed a 3-pointer in the closing seconds that could have won it for Notre Dame, but McCoy rebounded it and banked in a shot just before the buzzer. “Stedman has a will unlike most players I’ve seen,” Harris said. “He’s a fighter and he just willed us back into the game. Some of the shots he was making down the stretch were unreal. “We had chances, but you have to give them credit for knocking down free throws the way they did.”"